3/5/2010Share this story on Facebook! 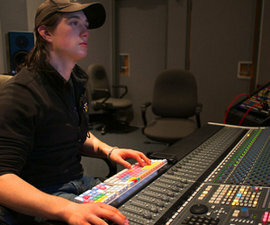 Dan Timmons '10 works in the sound recording technology lab on campus. Photo by Mike Grippi '10. Targeted toward rising seniors, the Emerson Summer Internship Award provides $3,000. Each year, the dean of each school can nominate one student for the award. Timmons’s award covered his credits and a portion of his housing costs. The Friends of Ithaca College Scholarship for Unpaid Internships makes grants to up to five students annually. Ever imagine getting to work with an A-list Hollywood director while still in college? With the help of IC music professor Alex Perialas, Dan Timmons ’10 landed an internship at Sound Lounge in New York City and spent much of his time working on a film about reggae legend Bob Marley being directed by Jonathan Demme. Exploring possibilities for his for-credit-only internship, a requirement for the sound recording technology major in the School of Music, Timmons wanted to stick to the music industry. So when Professor Perialas told him about Tony Volante, a friend who’s the head post-production mixer in the entertainment division of Sound Lounge, Timmons balked. Timmons landed the gig and began seven weeks of mixing, editing, and compiling audio elements, getting the computers ready, and assisting Volante with several sound-editing projects. For four weeks, Timmons worked with Oscar-winning director Jonathan Demme on Marley. Best known for Silence of the Lambs (1991), Demme also directed the Talking Heads’ Stop Making Sense and other music documentaries. He should know: After graduation, Timmons will go back to work at Sound Lounge, this time as a paid employee. Talk about working your Ithaca connections.